TaskLayout is a functional application that allows you to create multiple desktop layout files and use them to restore specific window configurations as needed. When you run a desktop layout file, all windows that were opened and active when you saved it will be restored. The tool can also come in handy for opening locations with long paths, and it remembers all the windows that were opened as well as where they were placed when you created the .TLF file which stores the layout configuration. 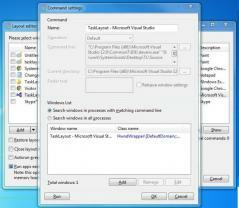 You can use TaskLayot to add Control Panel, Windows Explorer, text files, images and other dialogues to the layout file.